Peterborough cruiserweight Karl Wheeler says he either wins his big fight on Saturday night (May 14) - or he gets a proper job. Wheeler faces Jindrich Velecky for the vacant International Challenge Belt in Bethnal Green and at 33, he knows it’s a make-or-break fight. 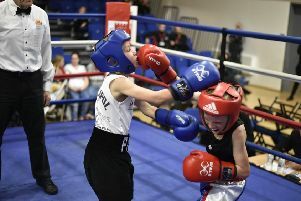 Currently ranked No 23 in Britain by Box Rec, Wheeler hopes victory this weekend will set up a challenge for the Southern Area title in Peterborough later this year. But he accepts he has no future in boxing if he loses the eight-round fight. Wheeler tops the bill at the famous East-End fight venue and said: “At this stage of my career, every fight is make or break. “I need to win to get the big fights and if I don’t win, I will have to grow up and go out and get a proper job. “I’m relying on my fiancee (Lisa Watton) to pay the bills at the moment and that can’t go on if I lose. “I’ve had a few jobs before and none of them were really me. “I was a website designer, I worked as a carpenter with my dad and I had a job in McDonalds as well, but all I really wanted was to get punched in the face ! “There’s no reason why I can’t go out there and get a job - I have qualifications - but I really believe I can make a good life for me and my family from boxing. “But I also realise that I’m running out of time. As always, Wheeler says children Onri and Summer are his inspiration going into this weekend’s fight - and says they will see a repeat performance at the York Hall. Wheeler, sponsored by Global Self Drive, Maximum Nutrition, Bore Hole Solutions, Apex, Barkingheads, Layla’s Lengths and Logic Security, came through a make -or-break fight there in March. He walloped Biola Kudus inside a couple of rounds to land the British Classic Challenge Belt and says he’s ready to show his nasty side again this weekend. He said: “(Trainer) Steve (Whitwell) wants me to show the same aggression I showed in my last fight. “He knows I have the boxing skills and I’ve shown that I can be vicious as well when I have to be. “Everyone around Peterborough knows me as a big, friendly giant, but if it means making a better life for me and my family, I can flick that switch and show a nasty side. Wheeler does face a durable opponent in Velecky, a 41 year-old from the Czech Republic. Velecky is a tough veteran of 60 fights who’s boxed up at heavyweight and has been the distance with ex-world champions Robert Stieglitz and Juan Carlos Gomez. Wheeler says he’s well prepared having had tough sparring sessions with Telford’s Lee Jones - “He’s as hard as nails,” he said - and is determined to stay on course for a big fight in Peterborough. “The show in Peterborough will definitely happen later this year - if I win,” he said. Tickets for the show at the York Hall are available from 07398-750739.